The study, which was funded by the National Science Foundation of China and involved researchers from 10 different institutions around the world, was published today (August 25) in the journal PeerJ. One idea about how we rate physical attractiveness is based on the impact that different aspects of our bodies (like body fatness) have on evolutionary fitness. For example, we know that above a certain body fatness females have greater risks of chronic diseases like diabetes and heart disease, and lower fertility, which might make fatter subjects less attractive. On the other hand, in the past fatter people might have had greater abilities to survive famines, making fatness more attractive. This might suggest there is an optimum level of fatness that is maximally attractive which is somewhere in between. The study was coordinated by Professor John Speakman, of the Institute of Genetics and Developmental Biology, Chinese Academy of Sciences, Beijing and the Institute of Biological and Environmental Sciences at the University of Aberdeen in Scotland. Professor Speakman explains: "Fitness in evolutionary terms comprises two things: survival and the ability to reproduce. What we wanted to investigate was the idea that when we look at someone and think they are physically attractive, are we actually making that assessment based on a hard-wired evolutionary understanding of their potential for future survival and reproductive ability?" To test their idea, the scientists built a mathematical model which combined the relationships between levels of obesity and the future risk of mortality from all causes, and the relationship between obesity and the future possibility of having children. This model predicted that people would perceive females with a body mass index (BMI) of between 24 and 24.8 as being the most physically attractive. Researchers then tested the prediction on more than 1,300 people, both males and females, from the UK and nine other countries. Participants were shown 21 image cards showing females with different levels of body fatness and were asked to reorder them from least to most attractive. In all the populations, males and females rated physical attractiveness of the female images very similarly. 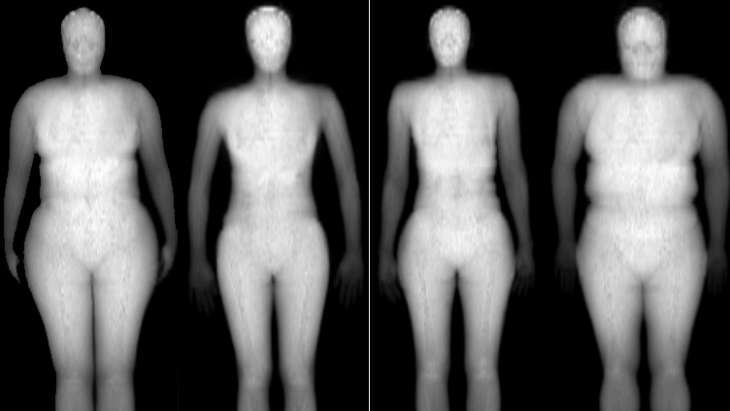 The very thinnest images with body mass index of around 19 were rated as most attractive. As fatness increased above that value, the less attractive they were rated. This contrasted the predictions of the mathematical 'fitness' model that there should be a peak in attractiveness around a BMI of 24 to 24.8. The reason for the discrepancy was revealed when subjects were asked how old they thought the people in the images were. In this exercise they judged that the fatter people were older. Age is itself a strong indicator of evolutionary fitness. When the age factor was included into the model the optimum fatness fell to a BMI somewhere between 17 and 20 – corresponding exactly to the images people found to be most attractive. This suggests that we find thinness in females so attractive because we equate it with youth - a BMI of 17-20 corresponds to the average BMI of a young 18-20 year old with maximal fertility and minimal risk of future disease. This was to be consistent across European, African and Asian test groups. Historical exposure to famine does not appear to have been an important factor driving the link between fatness and attractiveness. Dr Lobke Vaanholt, who organised the University of Aberdeen component of the study, said: "Although most people will not be surprised that extreme thinness was perceived as the most attractive body type, since this prevails so heavily in media, culture and fashion, the important advance is that now we have an evolutionary understanding of why this is the case." Professor John Speakman added: "I am delighted to have been involved in this international collaboration that has revealed evolutionary aspects of what people regard as attractive across diverse cultures. Setting this into an evolutionary framework allows us to understand why we perceive thinness in females to be so attractive. Importantly it also suggests that historical exposure to famine has not been an important factor." "This contrasted the predictions of the mathematical 'fitness' model that there should be a peak in attractiveness around a BMI of 24 to 24.8"
So they really thought that the most physically attractive body would be that of a person bordering on obesity? Seriously? And they think a NORMAL, HEALTHY bmi is "extreme thinness"?!! As if this wasn't weird enough, they also draw non-sequitur conclusions. Observers thought fat people were older than skinny people, therefore thinner people are deemed more attractive because they look younger, which is the evolutionary reason for this preference? I don't see how you can reasonably draw that conclusion from the data. Sounds like imposing preconceived ideas on the data to me. That wasn't a conclusion they made. They made parallel observations: people thought thin people were more attractive, and they also thought the fat people look older. Therefore the inference is that young people look more attractive, rather than people look attractive because they appear to be young. Some women of size are going to get their knockers in a twist over this, mark my words. The very idea that men would get to decide what they find attractive is problematic for some of them. The idea that it is a built-in evolutionary program is even worse. The implication that they are objectively evolutionarily less fit than other women sends them to the fainting-couch. No, obviously the cis-het-male patriarchal construction of standards of beauty is the problem. Fat women in nonwestern societies are usually considered more attractive than thin ones--but there is an evolutionary psychological explanation for this--attractiveness adjusts if exposed to famine caused thinness (something that once was the norm). But EP explanations can be made in any direction you want. "This might suggest there is an optimum level of fatness that is maximally attractive which is somewhere in between." That part is a little too much trivial. So now, the scientists have built a model which incorporates these factors(survival and ability to reproduce) plus youth that gives an optimum number for the BMI. I can understand that part, too. But comparing this number with the opinion of people (which in itself is a result of many factors and varies among different generations) and concluding that the age was the result of the discrepancy is way too much simple-­minded. Are we to believe that we now understand all factors important for attractiveness? Say for example, I find one more factor which is important for attractiveness (which I don't find very hard to find). Then the model would produce a different number and this makes this whole work worthless. Science used to be more than that. There's a more generalized criticism over these kinds of studies, which is that concentrating on a single factor creates the illusion of importance. However, this is not a problem of the study, but a problem of the reader. The example scenario is to ask people who are about to buy a car to rate cars according to how fast the electric windows wind up. Obviously the fastest is the best, so the experiment concludes that people would prefer a car with faster electric windows - when in reality people don't necessarily pay any attention to that detail when actually buying a car. In this study we're looking at a narrow selection of features in isolation from the rest, which reveals some information about those particular factors but does not disclose their importance relative to the whole deal. So you should really avoid over-interpreting and over-applying the results of the study. Docile, that a small sample of women with severe endometriosis are nearly 4x more likely to be attractive does not show that more attractive women are at higher risk for endometriosis. Your other attempted points are without evidence, and likely wrong. The pretty people tend to parthenogenesis and asexual life style - not just psychologically, but also biologically. Hmm, fascinating. I trained in genetics and I'm not aware of parthenogenesis occurring in humans having been reported in any of the literature, outside of some frankly dubious claims in religious texts, that is. I'd love to read your references for this. good luck with that... you're asking zephir to give you evidence. you know what that means? he still believes in aether theory and says we don't investigate cold fusion because of a worldwide conspiracy... and all that without getting into hot topics like Climate Change! Another study which turns the truth on its head. Look at women, the married are fatter on average, the older are fatter, the ones with kids are fatter. There has to be a reason since fatter is true both today and in the past. Look at all those medieval painting of women, fatter not thinner. Thinner is the way to attract a mate, most likely for the reason stated in the study. What happens if the women remains attractive? Death, destruction and no kids living to adult hood as the males fight for possession. How does the female solve this problem? She gets fat, any female who did not dies or her kids die which is the same thing. I don't see how you can reasonably draw that conclusion from the data. Sounds like imposing preconceived ideas on the data to me. This sort of "studies" always beg the question on why and how the cultural preferences of white US American males and females would be either be genetically or "evolutionary" coded.